Where birds know they are really loved! quakers, and those active and playful caiques. cleaned daily to keep a clean and healthy environment. Happy looking, we know you will love what you see! Please check daily as we try hard to keep all information current. Pictures and information will be listed on specified pages. Note: Please read complete policy statement as there will be no exceptions to any of the following policies. by seller. If remainder is not paid in full, buyer forfeits all money paid and bird will be sold to someone else. or seven days prior to shipping which will be stipulated by seller. Boarding of bird(s) will be at the discretion of seller and buyer will be charged $50 per week from time of weaning. to another buyer. There will be no exceptions to this policy! holds seller harmless and void of any refund responsibilities and delivery of bird(s). Owner reserves the right to refuse sell of any bird. All sells are made at owner's discretion. Vet determines that there is a pre-existing condition, seller will pay for any medication needed for the bird(s). Documentation of blood tests and examination MUST accompany complete diagnosis of pre-existing condition! 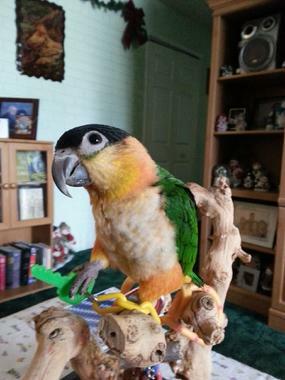 Owner suggests that buyers always do regular health check-ups by an avian veterinarian. covering ticketing, carrier, and carrier preparation. All babies sold before weaning will not be guaranteed! DNA testing performed at buyer's expense. bottom of the Nursery & Nestbox section. There are no exceptions to any of these policies! (PayPal includes a transaction fee). information and we will send you a price list. This site is managed by Naomi @ YshuaPets© located in South Florida.